This is a short post on the hazard that recliner chairs pose to kittens and cats. I am particularly concerned for kittens because they are able to crawl into smaller spaces. The idea for the post came from Elisa’s article on cat accidents that can happen in the home. Recliner chairs are pretty popular. Perhaps they are more popular with older people. Older people are potentially the best group of people to care for domestic cats because they are around the home more than active younger people. They are also less likely to be moving home and relinquishing their cat. Recliner chairs have a mechanism that allows the chair to recline. That is obvious. The mechanism is under the chair. The mechanism will by necessity have air spaces around and through it to allow it to work unobstructed. These air spaces are ideal dens and sleeping spots for kittens to curl up into. As these spaces are accessible from under the chair and close to the ground a kitten can easily jump up into the space. As it is impossible to see a cat in this space you can see how a disastrous accident can occur. When the chair is reclined the space will be compressed (flattened) or the shape and position of the moving parts will change. This is highly likely, perhaps almost certainly, to cause the kitten to be trapped and crushed. Severe injury is likely to result. Conclusion: Well, the obvious conclusion is not to buy a reclining chair if you keep cats and particularly if there is a likelihood of kittens being present in the home. If kittens and cats are to be in the home temporarily an alternative is to jam the recliner mechanism in the closed position, or block access to the underside of the chair or remove the chair to a locked room to which cats do not have access. I feel that there is a great and unrecognized danger to kittens particularly from recliner chairs of all types. 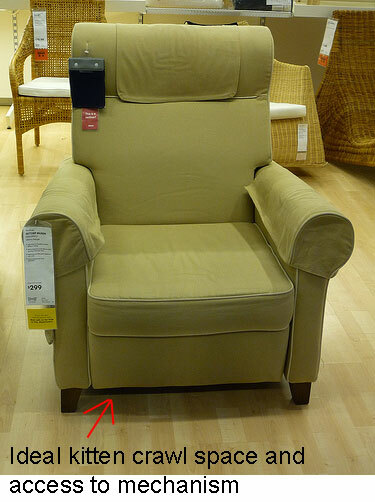 Note: Some recliners may well have a valance type structure around its base to prevent access but many don’t. Also these chairs will allow access when in the opened up (reclined) position. How do I go by fixing my recliner my Bengal kitten won’t stay out of it. Kayla, lock the mechanism so that it does not move. In other words turn it into a non-recliner. Or replace it with another piece of furniture. Or put something around the edge of the recliner which prevents your kitten getting under the recliner (this is probably not possible or impractical). But please do it asap. These are dangerous pieces of furniture for kittens and puppies or small dogs. Good luck. Just happened to me, really sad experience, I’d thought of it too, thought this recliner could kill the kitten, forgot, and it did, not sure how to feel. Only had her a week, she was so good, can’t get her out of my mind . I know it was quick, but still, she was so good, such a loss. So sorry to hear this Todd. It is a tough one emotionally. Good luck. Thanks for sharing. This picture is the style chair. Harley’s little body was stretched across the front bar, the chair goes down about 3″ above the floor when lifted. I believe the chair must have been reclined, and somehow, he got swept under it as she was moving from recline, to sit, stand. She is very hard of hearing, unable to wear a hearing aid, the tv is always very loud, so did not hear him. It is verbatim except for a tiny addition – the use in brackets of “riser recliner” to let Google find that phrase more easily. I hope you are OK with this and thanks again. OMG I hate to read that. It is so sad. I am so sorry to read your story. RIP Harley. It is so sad, Mary Lou. So sad. I am going to make your comment into an article to warn others. I’ll do it now. I hope you approve that. It may serve to protect others so some good comes from this terrible accident. Thanks for visiting and sharing Mary Lou. Tonight has been so horrible for me. My cat had kittens and they’re now a month and a half old. My mother is staying with me, and she has a recliner. Well I havent seen one of the kittens all day, her name was Snowball. When it was time to feed, all of the kittens came out but Snowball. I know the kittens like to sleep under the recliner. The first thing I do is go look under the chair, and I lift it up. Snowball is hanging there, lifeless, stuck between a piece of wood. I’m devastated and I can’t stop crying. I will never own a recliner and I am getting this one out of my house. Please beware of recliners, they’re dangerous! Our beloved cat, Angel, 13 years old climbed under our recliner and when my husband reclined back using the hand control, it killed her as she was primarily caught at her neck. Will spare you details but thank God is appears she died instantly. We took chair back to where we bought it and they were terriby sorry and said this had never happened before. Beware of recliners and animals. Thank you for sharing your recliner experience, horrible though it is. Manufacturers of recliners should put a warning on the product that it is unsafe in a home where there are kittens. There is no doubt this is true. My poor little kitten Tip was almost 2 months old but sadly because of the reclining mechanism inside our couch she is no longer with us. It cut her tail off and crushed her. We are devastated at the loss of our sweet little girl. Recliners around kittens will never end well anything can happen. We are currently looking for homes for our other 5 kittens 2 males and now 3 females if anyone would like one of these little fuzzballs please contact me and I will give you more information. We are in danville so please don’t be to far away I hope to find loving homes for all of them. Terribly sorry to read your story. Recliners are extremely dangerous for kittens particularly. Anyone who has cats should not have a recliner unless it has been checked out to be safe for cats. It is as simple as that. Good luck with rehoming your kittens. Bottom line: Having a power recliner on our couch was a HUGE, HUGE mistake. My wife and I are absolutely devastated. We have become so attached to our little Bailey. Please, for those of you have have kittens, GET RID OF YOUR RECLINERS. Our kitten’s surgery also set us back $1,300, and a lot of emotional trauma. Save yourself the money and the heartache. P.S. We’re throwing out this couch TOMORROW. Thanks for your comment in support of my article which I wrote some time ago. The very best of luck to Bailey, poor soul, for a full recovery. It must have been traumatic for your both too.